I have always made it a practice when traveling to eat as the locals do with a few exceptions. If I wanted to do everything as I have always done it, why would I travel. I can stay home and eat McDonalds or cereal and milk or fix my normal eggs and bacon or sausage. The one concession that I make is that I am very careful of what I drink. If it is not boiled like coffee or tea, I stick with bottled water unless I know that it is safe for me. Not only when traveling overseas, but also even in the USA. Sometimes different water will make me a little unsettled for a day or two. 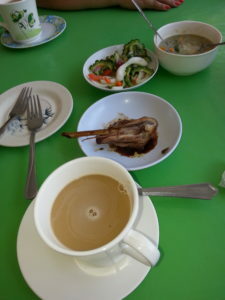 Since I was not cooking for myself in the Philippines, when I wasn’t eating with others that I was meeting with, I would go to a couple places to eat. I tried the local suggestions and can say that while they were different than what I eat in Cornfield County, Indiana, they were good. One morning, I had coffee in the form of 3 in 1. It is instant coffee, creamer, and cane sugar (according to the label) all pre-mixed in a sweet coffee. As a black coffee drinker, I would have preferred it, but the 3 in 1 is all they had, so I thanked them and drank it. In addition, I had a chicken drumstick, a salad made from various vegetables and what looked like a type of seaweed in an oil and vinegar dressing. This was accompanied by a soup. It was filling and all very good even though it wasn’t what I would have thought about on my own. 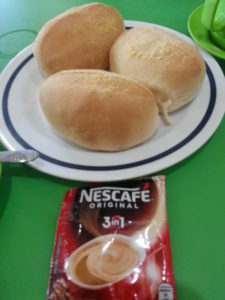 Another morning, I had 3 in 1 coffee and Pandesal rolls. These are a sweet dough roll coated with a bread crumb coating. They are delicious when fresh and warm. I have heard rumors that there is the possibility of a Pandesal roll that is not fresh but they were always sold out before they were very old. One of the mornings, we were going to have a meeting, one of the young ladies bought some for what they called “merienda” or light snacks. I really liked them because I try to avoid overly sweet foods like doughnuts and Danish rolls. They were very pleasantly balanced; just a hint of sweetness and a light and fluffy texture. I have decided that this winter I will try making some at home to enjoy. If you ever get a chance to try them, I am sure you will enjoy them but expect to get up early or they might be gone.